Mix of partially dehydrated snacks with internal flavouring in different shapes and sizes. Flavoured with a Hot & Spicy seasoning. Snack: Cereal Flour (Wheat, Rye, Maize, Rice), Potato (Starch, Flour), Onion Powder, Salt, Sugar, Smoke Flavour, Flavour Enhancers (621, 635), Turmeric, Colours (160a, 160c, 150d), Vegetable Extracts. 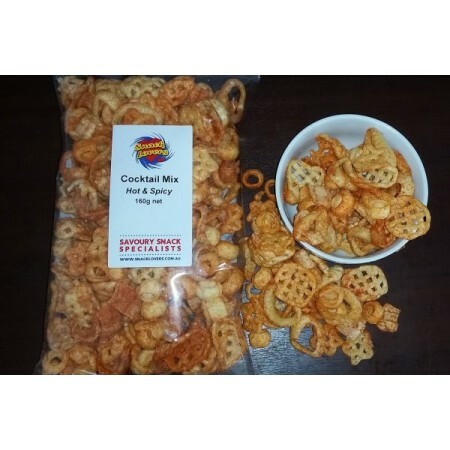 Hi-Oleic Sunflower Oil, Seasoning: Salt, Sugar, Vegetable Powder (Garlic), Hydrolysed Vegetable Protein (Maize, Soy, Wheat), Lactose, Herbs & Spices, Flavour Enhancer (621, 635), Acidity Regulator (262), Anti-Caking Agent (504), Spice Extract (160c). Contains WHEAT, RYE (GLUTEN), SOY, SULPHITES & MILK. This product does NOT contain any Meat or Meat derivatives.